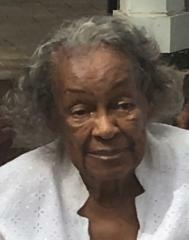 Mrs. Alvertia Williams-Scandrick made her transition July 6, 2018. She was a native of Wayne County, GA and lived most of her life in Savannah, GA. Mrs. Scandrick was a retired educator of Savannah-Chatham County Public Schools and a member of Butler Memorial Presbyterian Church. Mrs. Scandrick leaves to cherish her memories: Husband, Horace Scandrick, son Johnny E. Polite of Atlanta, GA, daughter Mrs. Daisy Latimer of Baton, LA, son Donald Keith of Knoxville, TN, four granddaughters, four grandsons, one sister, nieces, nephews, cousins, and a host of friends. She was preceded in death by two sons, Benjamin Polite, Jr. and Alan Polite. Graveside services will be held 11:00 a.m. Friday, July 13, 2018 at Lincoln Memorial Cemetery. Rev. Don Johnson will officiate. Please sign our guest book.